Last year, Oak Ridge National Laboratory (ORNL) announced that researchers had “successfully demonstrated that lithium-sulfur battery technology can indeed outdo lithium-ion on several fronts.” Theoretically, lithium-sulfur batteries could be four times as energy dense as today’s lithium-ion batteries, but that promise had yet to be demonstrated. ORNL took initial steps toward that goal, and within the last few months researchers at Vanderbilt University have shown a strong lead in forming lithium-sulfur batteries with commercial potential. Echoing work done at Sakti3, ORNL researchers demonstrated an all-solid-state lithium-sulfur cell, addressing flammability issues shared by batteries with solid electrolytes. 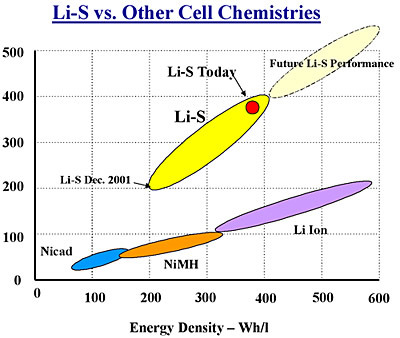 Using lithium polysulfidophosphates (LPSPs) in the cathode, and which have ionic conductivities eight times higher than that of lithium sulfide (Li2S) the team coupled that with a lithium anode to create “an energy-dense, all solid battery.” Energy density was a noteworthy 1,200 mili-Amp-hours per gram, about 7 to 8.5 times that of conventional lithium batteries. PR-speak aside, the accomplishments of Xingcheng Xiao, Weidong Zhou, Mei Cai and their colleagues result from looking for lighter and less expensive materials to replace the metal oxide in lithium-ion batteries. They faced the problem that lithium-sulfur compounds escape from their surroundings, causing batteries to lose charge quickly. This meant coming up with a way to encapsulate the active ingredients. Happy with their results, the team published its findings under the title, “Polydopamine-Coated, Nitrogen-Doped, Hollow Carbon–Sulfur Double-Layered Core–Shell Structure for Improving Lithium–Sulfur Batteries,” in the ACS journal Nano Letters. They apparently had help from General Motors Global Research & Development Center in Warren, Michigan, showing the automaker’s “fevered search” for better batteries. Myriad other projects are attacking the problem of making lithium-sulfur batteries a practical reality, and we may soon have commercial validation of their efforts. The blog will continue to report on these and other efforts. Dean, you consistently provide the latest news in battery development – Thank you!